The HP LaserJet 4240N is a speedy (40 pages-per-minute), reliable printer. It comes standard with 64 MB RAM and one 500-sheet cassette tray. A JetDirect RJ-45 port is also built into this printer so it is capable of connecting to a network. 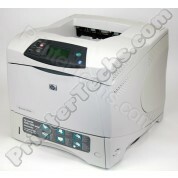 The HP LaserJet 4250 is a fast wokgroup printer. This is the non-network version of the 4250, if you want networking you'll need the 4250N (N=networking). Options include network cards, duplexers, and extra trays. This printer includes our exclusive metal swing plate gear for added durability. 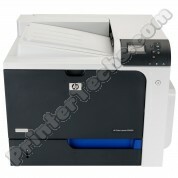 HP part number Q5400A . The HP LaserJet 4250TN comes with a network connector and two 500-sheet trays. This printer includes our exclusive metal swing plate gear for added durability. Other options include a duplexer, and/or extra trays. HP part number Q5402A . The HP 4300 comes standard with 64 MB RAM and one 500-sheet tray. Upgrade options include features like network cards, duplexers, and extra trays. 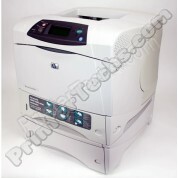 Other models in this series include HP LaserJet 4300N , HP LaserJet 4300TN , HP LaserJet 4300DTN. HP part number Q2431A .